The Cinque Terre are five coastal villages in the Liguria region of Italy known for their beauty, culture, food, and proximity to one another. Produce carts are commonly found in each village marketplace. 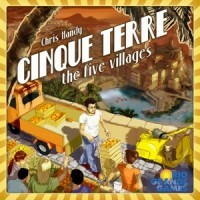 Cinque Terre is a simple pick up and deliver game in which you take on the role of a fruit and veg trader in Italy. The Cinque Terre board shows a map of 3 farms and 5 coastal villages in Italy, with a circular route passing through all 8 destinations. Each of the farms has either 2 or 3 fields containing a paricular colour of wooden cube, representing one of the eight types of fruit and veg in the game. Each of the villages has a set of four, three or two dice next to it (which you set up at the beginning of the game). Each die matches a colour of the wooden cubes. Take a card: Each card represents one of the 8 types of fruit and veg. There are four face-up cards available which gets replaced when it is taken, or you can take a lucky-dip and grab one from the top of the face-down deck of cards. Pick up some produce: If you are at a farm you can pick up produce (i.e. cubes) from the fields adjoining the farm. You either have to trade in a matching card from your hand for the type of produce you pick up or two matching cards of a different type of produce. You can carry up to 4 cubes at any time, and as long as you don’t exceed this limit you can pick up as many cubes as you like from a single farm in a single action. Move location: You can move up to 4 locations in a clockwise direction around the board. Sell produce: If you are at a village you can sell some or all of the produce you are carrying for Lire (Italian currency before the euro). So where do these dice come into it? Selling produce in different places can get you different amounts of Lire. As a minimum, you can sell any produce at any village for one Lire. However, if there is a die next to a village you can sell produce of the matching colour there for the value shown on the die. So if the village you are at has a yellow die next to it showing the value 3, you can sell yellow cubes (lemons) there for 3 lire each instead of 1. So I just need to sell stuff where it’s most expensive then! Not so fast, there are other ways to earn lire! If you are the first player to sell 8 items of produce to a particular village you become the “most popular vendor” there, and bag yourself some bonus cash! So I just need to sell stuff where it’s most expensive and always try to sell stuff in the same place? Again, not so fast! There is another way to earn yourself some lire – by fulfilling orders. 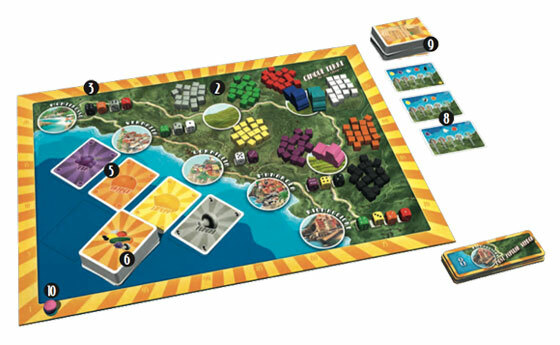 Next to the board there will be a few face-up order cards, showing the five villages with a particular type of produce next to two or three of them and a value. If at the end of your turn you have sold at least one of that type of produce at each of the villages, you can claim that order and claim the lire. You don’t have to sell all this produce this turn, it can have been at any point throughout the game (your player board keeps track of what you’re sold where). Then you have an extra decision to make – take a look at the next order from the top of the face-down deck. You can decide to keep this order as a secret order – if you do this only you can complete it and it remains secret until the end of the game, but you’ll lose points if you don’t. If you keep it you fill the empty order space on the table with the next order card from the deck. If you don’t keep it you place that order down in the empty space and choose if you want to take the next card off the deck as a secret order – but be warned, you have to choose to take it without looking at it and you can’t throw it away if you don’t want it. You will also start the game with a “starting order” which is a secret order and requires something to be delivered to each village. Wow! That’s lots of ways to make some money, so when does it all end? The game ends either when the supply of 2 of the 8 types of produce runs out or when one player has at least five fulfilled orders and MPV cards combined (this doesn’t include secret orders). At the end of the game lire is earned or payed out for compeleted and uncompleted secret orders and the player with the most lire wins. So what’s so good about this game? The great thing about this game is that it has very simple rules and is easy to teach, but there is a lot of strategy involved. How best to use your three actions, are you going to stop at several villages to get the best prices using up lots of actions or are you going to make one stop and sell everything in the same place? Should you sell where the prices are low to get a most popular vendor card? Is it worth fulfilling an order if the selling prices are low? Is it worth picking up and hoarding cards of high-value produce, letting everyone else fulfill the orders? Lots of decisions, and far more fun than moving little cubes around has a right to be. Also, the fact that the die rolls and colours are random means that the selling prices are different every game, one time everyone might be trying to sell everything at a single village or two, other times it might be more evenly distributed. This and all the different order cards gives this game a great replay value. If you love the accessibility, simplicity and fun of Ticket to Ride then I think you’ll love this too. What’s the worst thing about this game? The playing tokens are little trucks, which is great… but why oh why did they make them just slightly too small to put 4 cubes on the back? Every time I sit down with this game with somebody new they always try to put the cubes on the back of the truck, and I have to explain that they’ll fall off! And that’s the worst thing? Pretty much! So if you and your family/group play a lot of Ticket to Ride try giving this one a go, you won’t be disappointed! When I see this in the message for the week Adventure Explore I said this is the game about wizards and trolls making land. The one that isn’t Small World. I was excited because this game was interesting. I look and see this is a game about buying cabbages. WHAT? Who changed it??? Where are the wizard? Then I looked and realized that the game is Terre Mystique! I was fooled by these people! I am glad I was just reading for the adventure and not buying this in a store! I would have thought it was for magic but instead it would be vegetables. Add a Review for "Cinque Terre"